It is not always clear what meets the criteria to be considered luxury. However, in the case of the Volvo XC90 Inscription trim, it is quite clear that luxury describes it well. By paying attention to every detail, the designers of the Volvo XC90 were able to tick every box for the Inscription. 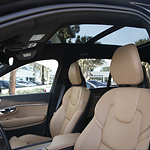 The Volvo XC90 doesn't fit the mold of the typical SUV. For one, the fuel efficiency that it is capable of reaching is above average for an SUV as large as it is, with an impressive 29 mpg on the highways. Coupled with this impressive statistic, the Inscription maintains plenty of room for both passengers and cargo, boasting a full seven seats with plenty of leg and headroom, and enough storage space to carry all the stuff you could ever need. If the Inscription sounds like a car that you would be interested in getting a closer look at, then come on down to Kempthorn Volvo Cars. We'll set you up with a test drive. Our showroom is located conveniently so you can come over at your leisure.